Definition (NCI_CDISC) Any viral organism that can be assigned to the species Human Herpesvirus 4. Definition (NCI_NCI-GLOSS) A common virus that remains dormant in most people. It has been associated with certain cancers, including Burkitt's lymphoma, immunoblastic lymphoma, and nasopharyngeal carcinoma. 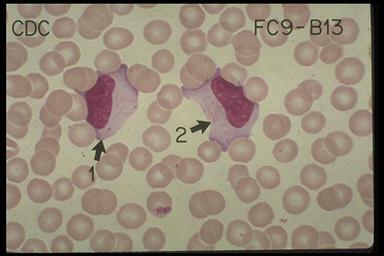 Definition (CSP) infects B-cells in humans; thought to be the causative agent of infectious mononucleosis and is strongly associated with oral hairy leukoplakia, Burkitt lymphoma, and other malignancies. Definition (MSH) The type species of LYMPHOCRYPTOVIRUS, subfamily GAMMAHERPESVIRINAE, infecting B-cells in humans. It is thought to be the causative agent of INFECTIOUS MONONUCLEOSIS and is strongly associated with oral hairy leukoplakia (LEUKOPLAKIA, HAIRY;), BURKITT LYMPHOMA; and other malignancies. A blood test can show if you have mono. Most people get better in two to four weeks. However, you may feel tired for a few months afterward. Treatment focuses on helping symptoms and includes medicines for pain and fever, warm salt water gargles and plenty of rest and fluids. Definition (MSH) A common, acute infection usually caused by the Epstein-Barr virus (HERPESVIRUS 4, HUMAN). There is an increase in mononuclear white blood cells and other atypical lymphocytes, generalized lymphadenopathy, splenomegaly, and occasionally hepatomegaly with hepatitis. Definition (CSP) acute disease characterized by fever and swollen lymph nodes and an abnormal increase of mononuclear leucocytes or monocytes in the bloodstream; not highly contagious; some believe it can be transmitted by kissing. This page was written by Scott Moses, MD, last revised on 3/15/2015 and last published on 4/6/2019 .